Sometimes the question of who is really the biggest actress or entertainer in the Nollywood industry has been clouding our minds and we only tend to guess who they could be. 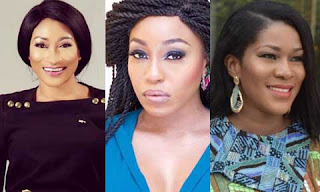 Since today is 8 of March and it is marked out as international women day, in that spirit Nigeriafilms list the top 10 actresses of all times in Nollywood. Oge Okoye, born in London and a graduate of Theatre Arts from Nnamdi Azikiwe University, Awka, Oge Okoye has featured in more than 60 movies since her acting career started in 2001 and some of her recent movies include: Marry Me, The Girl and Blackberry Babes. Another top Nollywood actress you don’t want to miss her movie. Jombo was born in Abiriba, Abia State, Nigeria. Seems like most Nollywood actresses were technologically inclined before they had a change of career, Uche is a graduate of Mathematics and Statistics from the University of Calabar, and Computer Programming from the Federal University of Technology Minna. She then ventured into the Nollywood in 1999; starring in the movie: Visa to hell. Jombo has featured in more than 60 movies. She is also a screenwriter and has written and co-written several other interesting movies which include: Games Men Play, The Celebrity, Girls in the Hood & A Time to Love. She has produced other Nollywood movies such as Nollywood Hustlers, Holding Hope and her latest work: Damage which deals with the issue of domestic violence in homes. This Glo Ambassador could be more described as an all-rounder. Mercy Johnson, an indigene of Okene in Kogi State is a popular Nigerian actress known for her natural and bold acting. She ventured into acting after failing her JAMB exam and has made her acting debut in the movie, “The Maid”playing the role of a possessed house help. Her performance in the movie shot her into the limelight. She has featured in other popular Nigerian movies. Her acting prowess has led her to star in more than 100 movies and has won her the African Film Award for best supporting actress in 2009. Ini Edo who is from Eket in Akwa Ibom State, and a Theater Arts graduate of University of Calabar is a household name in Nigerian movies. She began her film career in the year 2000, and has featured in more than 50 movies since that time. The beautiful Nigerian Nollywood actress who qualified as an estate manager has had a very successful career in acting. She is also a singer and launched her music career in 2005. Omotola Ekeinde burst into the Nollywood film industry with the movie “Mortal Inheritance” (1995) where she played a sickle-cell patient who fights for her life even when she knows she might not be able to live. At the end of the day, she has a baby and eventually lives. This film which received good reviews won her awards for her role in the movie and is still known as one of Nigeria’s best movies ever made. Genevieve was born on May 3, 1979, a native of Mbaise, Imo State, Nigeria. Referred to as the “Julia Roberts of Africa” by CNN, She won the African Movie Academy Award for Best Actress in a Leading Role in 2005.She was introduced into Nollywood in 1998 with the movie “Most Wanted” and since then has featured in over 80 movies. She is one of the highest paid Nollywood actresses and she has gone ahead to release her own music album. Other awards she received include: Best Actress of the year award at the 2001 City People Awards.